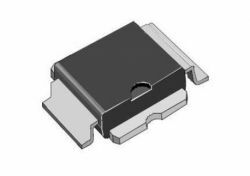 The PD55015-E is a common source N-channel, enhancement-mode lateral field-effect RF power transistor. It is designed for high gain, broad band commercial and industrial applications. It operates at 12 V in common source mode at frequencies of up to 1 GHz. The PD55015-E boasts the excellent gain, linearity and reliability thanks to ST’s latest LDMOS technology mounted in the first true SMD plastic RF power package, the PowerSO-10RF. The PD55015-E’s superior linearity performance makes it an ideal solution for car mobile radios. The PowerSO-10RF plastic package is designed for high reliability, and is the first JEDEC-approved, high power SMD package from ST. It has been optimized for RF requirements and offers excellent RF performance and ease of assembly. Mounting recommendations are provided in application note AN1294, available on www.st.com.